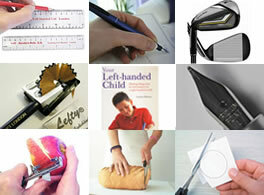 These are the top 10 left handed products based on orders on the Anything Left-Handed website over the past year. 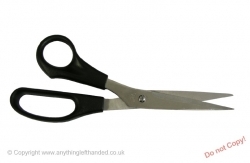 Fully left-handed scissors with moulded black plastic grip and reversed blades. 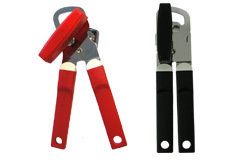 They are 8.5 inch (215mm) overall length with sharp stainless steel blades. Stabilo ‘s Move Easy rollerball pen, left-handed (code 531) The funky pen that looks the part, writes like a dream and is great fun to use. Unusually, the pen has been made with a special left handed version with the grip moulded for a comfortable fit in the left hand. Top marks to Stabilo for looking after the left-handers for a change! With its exchangeable rollerball tip cartridges, the Stabilo ‘S Move Easy glides perfectly over the paper and it can be erased with a fountain pen eraser just like normal fountain pen ink. The cap twists on and off to lock securely and can be snapped on to the end of the pen when you are writing so it will not get lost. Supplied with 3 blue ink cartridges. 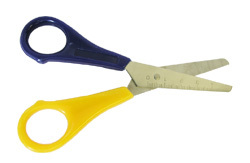 First scissor 125mm / 5 in., age 4 – 7 (code 134) These sturdy, lightweight scissors with brightly coloured plastic moulded grips and stainless steel blades are an ideal junior scissor. 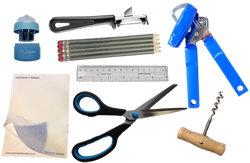 These safety scissors have rounded ends, but proper sharpened blades for cutting paper and thin material, so adult supervision is needed. 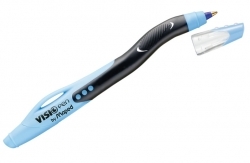 Maped Visio left handed ball pen (code 730) This pen features a hooked neck and off-centre tip which allows left handers to see what they are writing clearly and as the fingers are further away from the tip there is less chance of smudging. 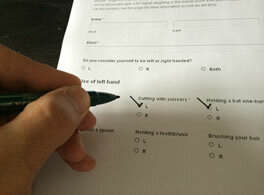 The pen has a soft-touch triangular grip area with the finger and thumb indentations positioned to encourage a correct left handed writing grip. Ruler 30cm, clear perspex (code 702) Soft plastic flexible ruler scaled in Centimetres / Millimetres only. 30cm length. All our left-handed rulers are scaled from right to left making it easy to draw lines of the correct length with the left hand, without obscuring the scale while you do it. HandiWriter writing aid (code 604) This simple device is made up of a large loop made of soft elastic (like a hair scrunchy) that goes over the wrist, a small loop that goes around the pencil or pen and a cord with a charm on the end that is held in the palm of the hand. 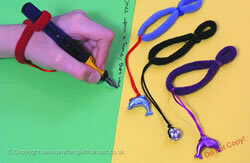 These work together to encourage a perfect grip and writing style without even trying! 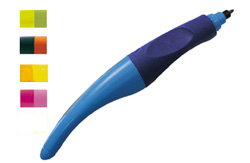 Sattler moulded pencil grip, pack of 3 (code 227F) The Sattler Grip is an innovative design which gently guides the fingers into the ergonomically correct writing position. Fits on Pencils, Markers, Pens, Crafting Knives, Brushes etc. 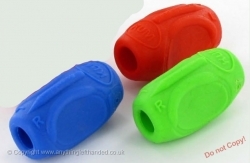 Can be used left or right handed and is marked with the correct positions for each hand. Tin opener with geared rotary action (code 94) A good quality left-handed tin opener with roller cutter and geared action for easy opening. Positioned on the left side of the tin and turned with the left-hand in a natural motion for left-handers. 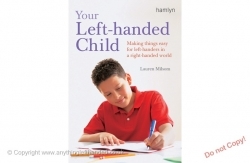 Your Left-Handed Child Download Ebook – Essential reading for any parent or teacher of a left-handed child, this book is a practical and comprehensive guide to the challenges your left-handed child may encounter from their first years right through school life and beyond. From basic skills like dressing and handwriting, to learning new sports and musical instruments, this beautifully illustrated book explains common problems caused by right handed bias in equipment and layout and offers ways to help your child harness their natural creativity and problem-solving skills to become adaptable and confident in a right-handed world. I wish these products when I was a kid. I’m 63 years old and not once was I offered any help from anyone to deal with left handed problems. Bless this company! Although left-handed there have been many write-handed ways I have adapted. I have always written with my hand below where I am writing, ergo, no sniffing. Also, using a mouse right-handed just feels right. Unintended pun. However, I would never say that I am ambidextrous. Note, that dexter, or dexterous, is Latin for right. Camping gear “SPORK” (made by Light My Fire, Sweden) is now available in a left-handed version !!! !!! !! !